You don’t have to have a genetic predisposition to suffer with substance use disorder. More and more, we are seeing scientific studies that show stress can alter the brain, making it susceptible to addiction. Yet, we live in a society with ever increasing stressors—like work, family, and money. Perhaps this is why leading substance abuse experts suggest dealing with the root of those stressors as a strategy to deal with the ever increasing numbers of people suffering with addiction and stress. A short while ago, I read an article written by psychiatrist Richard Friedman—What Cookies and Meth Have in Common. While his piece focused on the similarities in drug and food addiction, he explained that humans have created the perfect environment for addiction due to the impossible amounts of stress that we face every day. Fieldman explained that we all have triggers that lead us to either drink, drug, or eat addictively—they provide a level of solace. Despite a body of scientific evidence that now connects stress to addiction, Friedman highlighted that there remains a disparity between how we view and accept comfort eating, but some still see drug addiction as a moral failing or a poor choice. He suggests that they are both addiction. I believe that for me, it was a combination of mental illness and inability to cope with stressors that led to substance use disorder. The substances provided escape and they medicated by mental illness. Science now tells us that drugs, alcohol, and certain foods have the same effect of stimulating the brain’s reward center through the release of dopamine—a chemical responsible for making us feel good. The brain remembers that reward and seeks it out again by repeating the behavior. 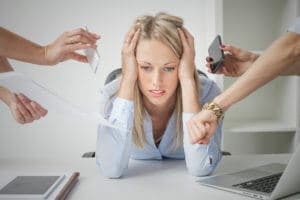 What we are becoming more aware of is the overwhelming evidence that stress can biologically affect the brain in a way that can lead to addiction. Friedman stated that we don’t all have the same amount of dopamine receptors (D2) in our brains: “Today, the more D2 receptors you have, the higher your natural level of stimulation and pleasure — and the less likely you are to seek out recreational drugs or comfort food to compensate.” He cites studies that found both stress and the use of addictive substances contribute to lower levels of D2—even in otherwise healthy participants. That deficiency in receptors continues long after you stop using drugs too, with former users being less motivated and discontent. These factors contribute to the desire to seek reward chemically. Like others before him, Friedman cited a number of studies which demonstrate that those who have substance use disorder have some sort of impairment in their rational brain—the pre-frontal cortex. That area of the brain that is responsible for rational thought, the ability to think critically, and where we exercise restraint. Friedman referred to a study which proved that exposure to addictive substances also contributes to a loss of self-control because lower dopamine receptors correlates to lower activity in the prefrontal cortex. What is interesting is that Friedman says that even people who are not hard-wired for addiction can be made dependent on drugs if they are stressed. He said, “You will literally have a different brain depending on your ZIP code, social circumstances, and stress level.” However, just because you’re exposed to stress doesn’t mean you’ll acquire substance use disorder—you have to actually be exposed to drugs. What he is suggesting is that these stressors lead people to seek solace in drugs and other addictive substances—like food—especially because they release dopamine and create an irrational craving for more. Friedman concludes, “Even the most self-disciplined can fall prey to a food or drug addiction under the right mix of adversity and stress,” which simply highlights that addiction is certainly not a matter of having no self-control, or a moral failing—stress plays a huge factor too. My experience is that stress (and depression and anxiety) has been in my life for as long as I can remember. As a child, I suffered huge stress as I moved countries and left my father at 3 years old. The adjustment to re-integrating to a new life and culture in the UK was immensely stressful. Some of my earliest memories include feeling depressed and anxious. I later discovered that alcohol and drugs medicated those feelings and stressors. Perhaps now, I understand that those stressors, mental illness, and genetics created the perfect environment in my brain for addiction and stress to take hold. It was only once I got sober that I was able to really get to the root of my trauma and examine those stressors. As we know, recovery isn’t about not drinking; it’s about learning to cope with life without the use of drugs. Had I not developed coping strategies, I don’t think I would have been able to handle the stress I have in the last year—my brother dying, moving continents (again), and starting a business. 1. Stress relieving activities that enable me to burn off the stress hormone, cortisol. I attend restorative yoga, go to the gym, and lift heavy weights. 2. I process my thoughts and feelings through journaling, blogging, and writing. 3. I regularly attend a support group (Refuge Recovery) where I can verbally express my thoughts and feelings in an empathetic environment. 4. I regularly speak to a support network of friends and tell them what is going on for me. 5. I support my body nutritionally by eating whole foods full of vitamins and minerals. 6. I ensure I get eight hours sleep a night. 7. I have a number of relaxing activities that I can do: yoga, baths, reading a book, quiet time, walking in nature. The reality is that this life is challenging and stressful. Taking drugs to cope with stress will only ever make matters worse. Experiencing that stress without drugs makes us stronger, more resilient, and better able to handle anything life throws at us.